Yes, But Resilience for Whom? I sense a little bit of history repeating, and not the good kind. About ten years ago, I was deeply involved in the field of conflict early warning and response. Eventually, I realized that the systems we were designing and implementing excluded at-risk communities even though the rhetoric had me believe they were instrumented to protect them. The truth is that these information systems were purely extractive and ultimately did little else than fill the pockets of academics who were hired as consultants to develop these early warning systems. The prevailing belief amongst these academics was (and still is) that large datasets and advanced quantitative methodologies can predict the escalation of political tensions and thus impede violence. To be sure, “these systems have been developed in advanced environments where the intention is to gather data so as to predict events in distant places. This leads to a division of labor between those who ‘predict’ and those ‘predicted’ upon” (Cited Meier 2008, PDF). Those who predict assume their sophisticated remote sensing systems will enable them to forecast and thus prevent impending conflict. Those predicted upon don’t even know these systems exist. The sum result? Conflict early warning systems have failed miserably at forecasting anything, let alone catalyzing preventive action or empowering local communities to get out of harm’s way. Conflict prevention is inherently political, and “political will is not an icon on your computer screen” (Cited in Meier 2013). In Toward a Rational Society (1970), the German philosopher Jürgen Habermas describes “the colonization of the public sphere through the use of instrumental technical rationality. In this sphere, complex social problems are reduced to technical questions, effectively removing the plurality of contending perspectives” (Cited in Meier 2006, PDF). This instrumentalization of society depoliticized complex social problems like conflict and resilience into terms that are susceptible to technical solutions formulated by external experts. The participation of local communities thus becomes totally unnecessary to produce and deliver these technical solutions. To be sure, the colonization of the public sphere crowds out both local knowledge and participation. We run this risk of repeating these mistakes with respect the discourse on community resilience. While we speak of community resilience, we gravitate towards the instrumentalization of communities using Big Data, which is largely conceived as a technical challenge of real-time data sensing and optimization. This external, top-down approach bars local participation. The depoliticization of resilience also hides the fact that “every act of measurement is an act marked by the play of powerful relations” (Cited Meier 2013b). To make matters worse, these measurements are almost always taken without the subjects knowing, let alone their consent. And so we create the division between those who sense and those sensed upon, thereby fully excluding the latter, all in the name of building community resilience. Acknowledgements: I raised the question “Resilience for whom?” during the PopTech and Rockefeller Foundation workshop on “Big Data & Community Resilience.” I am thus grateful to the organizers and fellows for informing my thinking and the motivation for this post. The Shire is a local community of Hobbits seemingly disconnected from the systemic changes taking place in Middle Earth. They are a quiet, self-sufficient community with high levels of social capital. Hobbits are not interested in “Big Data”; their world is populated by “Small Data” and gentle action. This doesn’t stop the “Eye of Sauron” from sensing this small harmless hamlet, however. During Gandalf’s visit, the Hobbits learn that all is not well in the world outside the Shire. The changing climate, deforestation and land degradation is wholly unnatural and ultimately threatens their own way of life. Gandalf leads a small band of Hobbits (bonding social capital) out of the Shire to join forces with other peoples of Middle Earth (bridging social capital) in what he calls “The Fellowship of the Ring” (resilience in diversity). Together, they must overcome personal & collective adversity and travel to Mordor to destroy the one ring that rules them all. Only then will Sauron’s “All Seeing Eye” cease sensing and oppressing the world of Middle Earth. I’m definitely no expert on J. R. R Tolken or The Lord of the Rings, but I’ve found that literature and indeed mythology often hold up important mirrors to our modern societies and remind us that the perils we face may not be entirely new. This implies that cautionary tales of the past may still bear some relevance today. The hero’s journey speaks to the human condition, and mythology serves as a evidence of human resilience. These narratives carry deep truths about the human condition, our shortcomings and redeeming qualities. Mythologies, analogies and metaphors help us make sense of our world; we ignore them at our own risk. This is why I’ve employed the metaphor of the Shire (local communities) and Big Data (Eye of Sauron) during recent conversations on Big Data and Community Resilience. There’s been push-back of late against Big Data, with many promoting the notion of Small Data. “For many problems and questions, small data in itself is enough” (1). Yes, for specific problems: locally disconnected problems. But we live in an increasingly interdependent and connected world with coupled systems that run the risk of experiencing synchronous failure and collapse. Our sensors cannot be purely local since the resilience of our communities is no longer mostly place-based. This is where the rings come in. Frodo’s ring allows him to sense change well beyond the Shire and at the same time mask his local presence. But using the ring allows him to be sensed and hunted by Sauron. The same is true of Google and social media platforms like Facebook. We have no ways to opt out from being sensed if we wish to use these platforms. 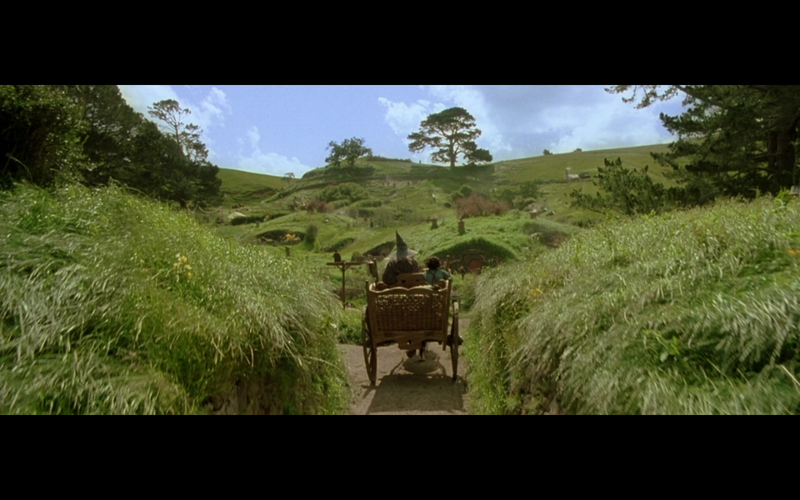 Community-generated content, our digital fingerprints, belong to the Great Eye, not to the Shire. This excellent piece on the Political Economy of Twitter clearly demonstrates that an elite few control user-generated content. The true owners of social media data are the platform providers, not the end users. In sum, “only corporate actors and regulators—who possess both the intellectual and financial resources to succeed in this race—can afford to participate,” which means “that the emerging data market will be shaped according to their interests.” Of course, the scandal surrounding PRISM makes Sauron’s “All Seeing Eye” even more palpable. So when we say that we have more data than ever before in human history, it behooves us to ask “Who is we? And to what end?” Does the Shire have access to greater data than ever before thanks to Sauron? Hardly. Is this data used by Sauron to support community resilience? Fat chance. Local communities are excluded; they are observers, unwilling participants in a centralized system that ultimately undermines trust and their own resilience. Hobbits deserve the right not to be sensed. This should be a non-negotiable. They also deserve the right to own and manage their own “Small Data” themselves; that is, data generated by the community, for the community. We need respectful, people-centered data protection protocols like those developed by Open Paths. Community resilience ought to be ethical community resilience. To be sure, we need to place individual data-sharing decisions in the hands of individuals rather than external parties. In addition to Open Paths, Creative Commons is an excellent example of what is possible. Why not extend that framework to personal and social media data? Why not include a temporal element to these licenses, as hinted in this blog post last year. That is, something like SnapChat where the user decides for herself how long the data should be accessible and usable. Well it turns out that these discussions and related conversations are taking place thanks to my fellow PopTech and Rockefeller Foundation Fellows. Stay tuned for updates. The ideas presented above are the result of our joint brainstorming sessions, and certainly not my ideas alone (but I take full blame for The Lord of the Rings analogy given my limited knowledge of said books!). ps. I’m hoping my talented fellows Kate Crawford, Gustavo Faleiros, Amy Luers, Claudia Perlich and Jer Thorp will chime in, improve my Lord of the Rings analogy and post comments in full Elvish script.